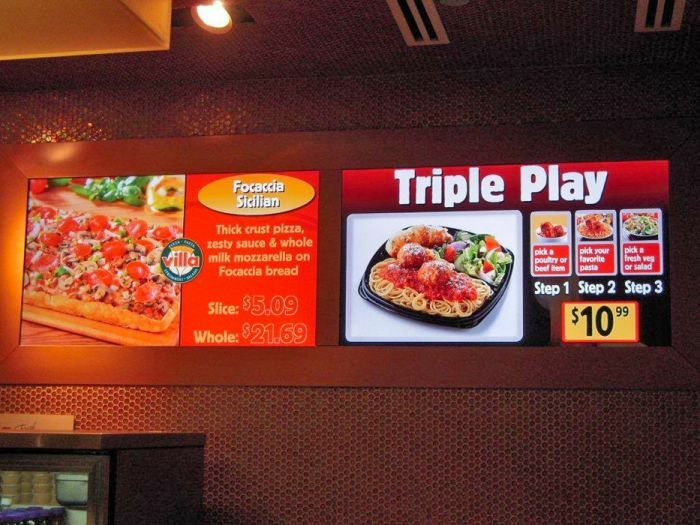 OSM Solutions designed custom two-panel menu board systems with BrightSign HD210 controllers and 46" LED displays for the shopping mall restaurants. Both were developed to attract customers and help the restaurants compete in their busy food courts. At Villa Fresh Italian Kitchen, one set of menu boards is used to invite visitors to take advantage of its Triple Play specials and the other set to provide graphically enticing reasons to order its value meals. The vertical two-panel menu boards for the Di A Sushi & Mongolian Grill's display complement the restaurant's Pan Asian décor, adding to its clean, welcoming environment. Although the Italian restaurant is in the Los Angeles, CA area and the Pan Asian restaurant is in Trumbull, CT, OSM Solutions uses the networking capabilities of the BrightSign HD210s to remotely update prices and menu items on the menu boards as often as needed from its home base in Austin, TX. Project: OSM Solutions designed custom two-panel menu board systems with BrightSign HD210 controllers and 46" LED displays for the shopping mall restaurants. Both were developed to attract customers and help the restaurants compete in their busy food courts.